Born in Ottawa, Illinois, Walt Willey attended Southern Illinois University, where he majored in Fine Arts. It was during his time at college that he became involved in acting, performing major roles in several productions. In 1981, Walt left Illinois for New York to break into acting professionally. 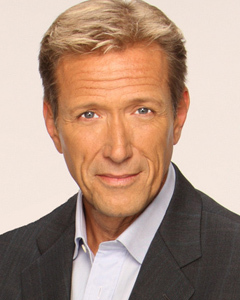 After numerous Off-Broadway productions, including Dust Off with Dan Lauria, and stints on NBC’s Another World as James La Russo, and Joe Novak on ABC’s Ryan’s Hope, Walt joined the cast of ABC’s All My Children in 1987 – playing the role of lawyer Jackson Montgomery – until the show’s demise in 2011. Walt branched out into stand-up comedy in 1990 entertaining across the country, headlining at such famous comedy clubs as Caroline’s in New York, Zanies in Chicago, and the Comedy Store in California. He continues to tour nationally, and friend and fellow comic, The View‘s Joy Behar, proposed him for membership into the famous Friars Club. Walt joined the likes of Milton Berle, Sid Caesar, and Billy Crystal when he was inducted into this prestigious entertainment fraternity in January 2001. In 2006, Walt released Wild and Willey, his first comedy DVD. Walt has hosted and co-hosted numerous national and international events and shows. A published satirist and cartoonist, Walt has been a regular columnist and cartoonist for Soap Opera Update and Soap Opera Weekly. His lithograph, “Soaperman”, hangs in Chicago’s Underground Comics Hall of Fame, and his collection of drawings, The Arthurian Legend: A Re-Telling of the Christ Myth garnered popular and critical raves during its gallery tour. In 2009, Walt co-founded a regional community theatre in his hometown of Ottawa, Illinois where they have presented The Odd Couple, Arsenic and Old Lace, Plaza Suite, and Harvey, as well as original works of local historical significance. Guest artists have included: Jill Larson, Julia Barr, Taylor Miller, Kale Browne, and Vincent Irizarry. Walt has been touring with the one-man show he authored, Wild Bill! An Evening with James Butler Hickok, often in conjunction with his Wild Bill! In-School Program for high schools. Walt regularly hosts charity fundraisers and developed the WilleyWorld Endowment Fund benefiting children’s charities. When not working, Walt resides in Santa Fe, New Mexico, with his son, Chance, and daughter, Merit. To learn more about Walt and his upcoming projects, please visit Walt’s website.